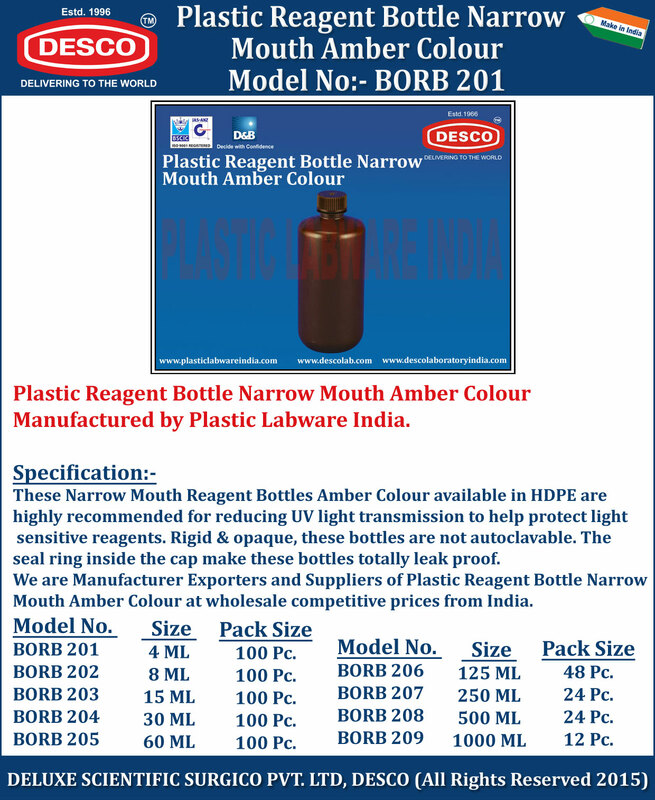 These Narrow Mouth Reagent Bottles Amber Colour available in HDPE are highly recommended for reducing UV light transmission to help protect light sensitive reagents. Rigid & opaque, these bottles are not autoclavable. The seal ring inside the cap make these bottles totally leak proof. We are Manufacturer Exporters and Suppliers of Plastic Reagent Bottle Narrow Mouth Amber Colour at wholesale competitive prices from India. BORB 201 4 ML 100 Pc. BORB 202 8 ML 100 Pc. BORB 203 15 ML 100 Pc. BORB 204 30 ML 100 Pc..
BORB 205 60 ML 100 Pc. BORB 206 125 ML 48 Pc. BORB 207 250 ML 24 Pc. BORB 208 500 ML 24 Pc. BORB 209 1000 ML 12 Pc.